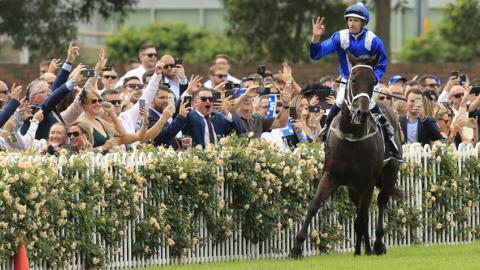 Australian racehorse Winx extended her record-breaking win streak to 32 with victory in the George Ryder Stakes at Rosehill Gardens. Winx justified odds of 1-17 as she claimed a 24th top-level Group One win under jockey Hugh Bowman. "When the crowd erupted I could feel the energy increase in her body, it was just so exciting," he said. "I'm so proud of her and proud to be part of it." After victory. the seven-year-old horse was welcomed back by the crowd chanting "Winxy, Winxy". It is expected Winx's extraordinary career will to come to an end after the Queen Elizabeth Stakes at Royal Randwick next month. Earlier this month, she won a world record 23rd Group One race. That victory passed the record of the Willie Mullins-trained former Champion Hurdle winner Hurricane Fly who was retired in August 2015. Winx has won 36 times in 42 races. Her last defeat was in April 2015. How to get into horse riding, whether you want to work with horses at the stables or become a fully fledged jockey.